A few weeks ago we went to our friend’s house for dinner. I decided to bring a salad because I was really craving something fresh, healthy and that represented Spring. I came up with the following and it was delicious! Place mesclun in a large bowl. Top with pea shoots, shaved fennel, cucumber and red onion. Coarsely chop segmented grapefruit (retaining and juice) and add to salad. 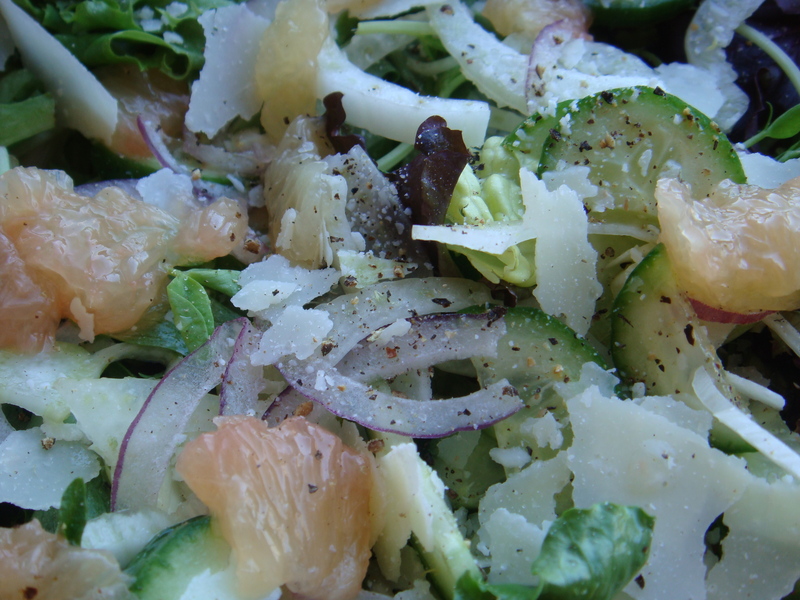 Sprinkle salad with shaved parmesan and freshly ground sea salt and pepper. For the dressing, make a classic vinaigrette, but substitute the grapefruit juice and Meyer lemon juice for the vinegar. I didn’t add mustard to my dressing, but I think you could and it would still blend beautifully. Rather, I added some chopped fresh shallots for a little additonal zing. Dress right before eating. This salad is great paired with any spring dish, such as asparagus risotto, a quiche or even grilled seafood or chicken. The addition of avocado, to make it more of a meal, would be a nice touch as well.